And it has been a very busy spring and summer this year. The warm weather started with a construction project. Now, neither of us are experienced in this activity, but we used our wits and came up with a plan. We needed a small chicken coop for four new life forms that were going to be joining us in a matter of weeks. We each drew what we thought would work, and when we compared our diagrams, we had drawn the same style of coop. That was a good start - no disagreements to overcome. My main concern - it had to be strong enough to withstand the many types of wildlife that visit us regularly. I don't want my chickens to be their meals. We built it sturdy and strong - both the coop and the attached pen. Thick wood and hardware cloth instead of chicken wire will hopefully keep them safe. Comparing what we built with the ones available at the hardware store, I would say we did a fine job. The cost was minimal as we recycled most of the parts. 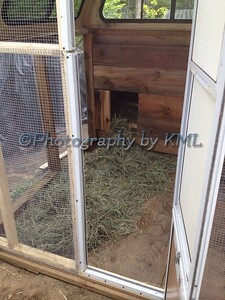 After adding the hay, the chickens new home was ready - and just in the nick of time for their arrival!